A full list of the top 25 ecommerce sites can be found here. So how do you compete in such competitive niches where you have the largest of the large and best of the best directly trying to outrank you? 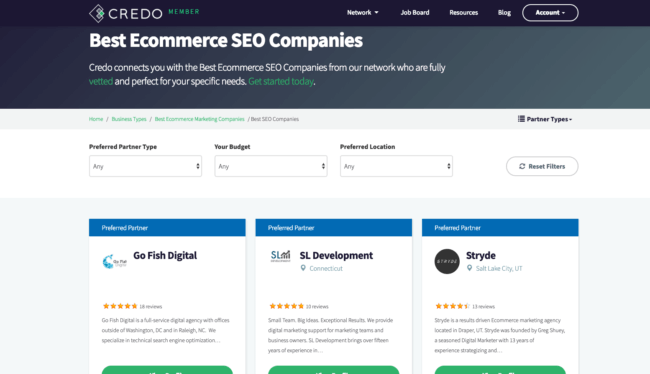 If you’re a large ecommerce company doing over $1M per year in revenue and ready to take your organic traffic to the next level, you have a broad array of SEO strategies available to you that can work. If you’re a small store, potentially on a platform like Shopify, then you’re probably just starting out and don’t have a brand established yet. SEO for your store is going to look very different from the big stores. That said, there are some strategies that every ecommerce shop needs to employ in order to make sure the base is set and you are ready to grow and scale as your brand grows, your links increase, and your SKUs increase. Your ecommerce store needs to be organized if you are going to stand a chance of ranking well. Every product needs a subcategory or two, every subcategory needs a category, and so on. One of the areas where I see ecommerce stores really fail out of the gate is by failing to do the keyword research necessary to identify the content and structure of your category and subcategory pages to contain all of your products. 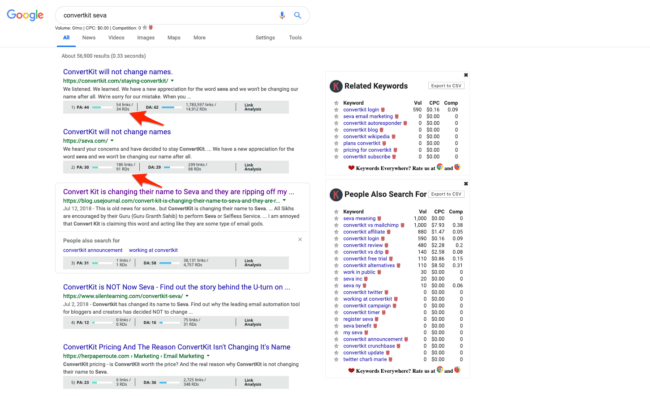 When you fail to do this keyword research and instead just launch top-level pages targeted to terms like [nike shoes], you are losing out on a huge longer tail of potential traffic that you could begin to grab by having pages dedicated to those terms. If your ecommerce store sells shoes, you absolutely should have a [nike shoes] page high in your website’s architecture. 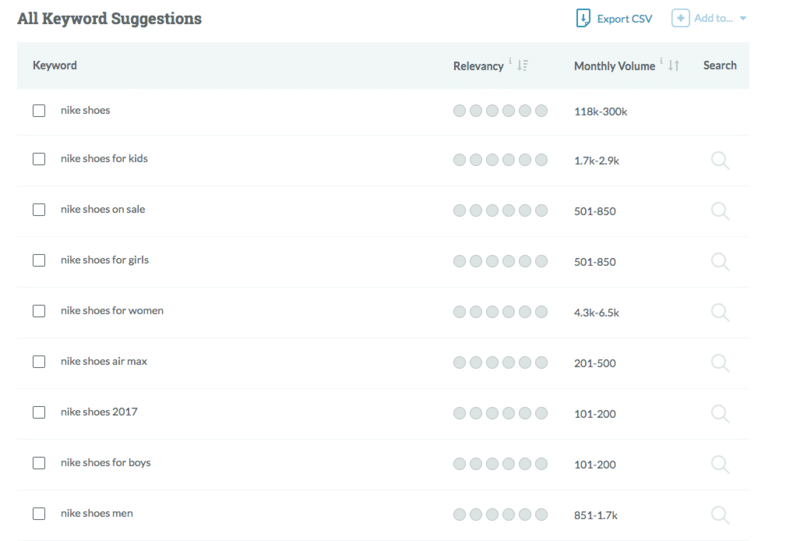 But check out all of those other keywords that have search volume that are much more specific (and thus likely to convert better than a general nike shoes query) that you’d be missing out on targeting if you only had a Nike shoes page with filters down to these areas! Both new sites and long established ecommerce sites need to recognize that most of your traffic will come in the long tail, for brand + model or model queries, and not from big queries like [nike shoes] or [real estate]. I also would love to rank for general queries like that, but if you spend all your time chasing one head term like that then you’re missing the beautiful forest for one tall tree. Linked internally from other pages on your website through the front end. Remember that crawling does not equal indexation, and indexation alone is not enough to rank. If you want a page to rank in the search engines, that page must be linked internally from other strong pages on your site and be discoverable from your homepage within a maximum of 5 clicks. Otherwise, your chances of ranking become much lower. You may not have heard the term, but you definitely know what breadcrumbs are. They can be thought of as a sub-menu that shows the structure of your site to both users and search engines to help them navigate back up the chain to the page where they were previously. These links not only help people navigate back to your main pages, but they also help drive more internal links with your desired anchor text back to your higher level category pages. Your higher level category pages should be targeting big keywords, so these need more links to them to rank! One very popular and effective way to get as many of your products as possible indexed is through related products modules on product pages that encourage users to also view other products that they might be interested in instead of the page they are currently on. I have already been touching on this while talking about categories/subcategories/products and related products, but a straight forward site architecture organized well is the best SEO strategy for an ecommerce site, especially one with a large number of SKUs. 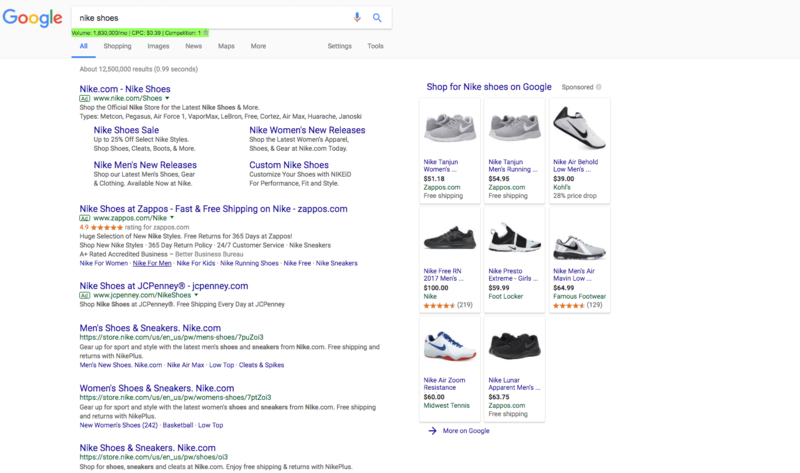 Your categories, which target your head terms like [nike shoes] should be linked from your homepage as well as across the site through top navigation. Your subcategories should at minimum be linked from its parent category as well as the products located within that subcategory. If the subcategory is also targeting a competitive term, then you may also want to link to it from your top navigation or a secondary category-specific navigation that applies to all the subcategories under that category as well as the products. The goal is to silo your content into groups that make sense, instead of linking haphazardly to products and categories that do not make sense for users or the search engines. If you know anything about SEO at all, you know that you should have XML sitemaps (protocal page here) that list out all of your URLs so that you can then submit them directly to the search engines through Google Search Console and Bing Webmaster Tools. The area where many ecommerce and large websites fall down is in segmenting their sitemaps by type (category, subcategory, tag, product) so that they are able to quickly identify indexation problem areas. As you can see there, we are able to recognize that our photos set of products have low indexation for the most part (this has improved in recent months). We never would have been able to recognize that had we not segmented our sitemaps by type. One major area where I see a lot of ecommerce and other large sites fail is by confusing a facet for a filter. In the wording I used at the top of this page, these are your categories and subcategories. Interestingly, Zappos then canonicals this page back to their Nike Men’s Sneakers page instead of handling it with a parameter and then within Search Console/Bing Webmaster Tools. This is absolutely a legitimate way to do it and the right solution depends on how your site is set up. The first is the main ecommerce marketing companies page filtered down to “SEO” and “consultants”. This is handled via filters and canonicals back to the /biztypes/ecommerce/ page. The second one is my subcategory/multitaxonomy category page targeted at the search term [ecommerce seo consultants]. This page is indexed and ranks. As I’ve noted above in the Filters section, one easy way to mess up your organic traffic on an ecommerce store is to allow parameters and filters to run wild by not controlling them with a canonical or via the Parameters report in Google’s Search Console and Bing’s Webmaster Tools. Basically what this report does is tell you the parameters that they have found on your site that may either be used to change the page or to filter down content but not necessarily create a new page. Using the table above (which is from Credo), you can see that I have marked some as Representative URL which means that they should not consider URLs with that parameter to be meaningfully different from the non-parameter version, and thus there is one that they should instead crawl/index/rank. Representative URL – use this if the parameter is a filter that does not meaningfully change the content on the page, but rather narrows it. Let Googlebot decide – if the parameter is used in multiple places on the site, you can let Googlebot figure out what to do with it (default behavior). I also recommend reconfiguring how those parameters work so you can more closely define Googlebot’s treatment in the different areas. No URLs – if you do not want them to crawl/index any of the URLs with that parameter. Use very carefully. A parameter audit is one of the first things I do when I start working with a new website, and can be used to optimize the search engine’s crawl of your site which leads to better indexation and ranking! Finally, there are some technical basics that all ecommerce stores need to get right to drive SEO success. As you build your site architecture, you need to think very carefully about the pages you allow the search engines to index so that you do not end up causing yourself harm in the future. In the above case, the site has not determined if they want to organize the site by types (shoes/shirts) or gender (men/women). My recommendation would be to do it by types and then have the gender/style as a facet. But I also have https://www.getcredo.com/partner-type/consultants/ which targets “marketing consultants”. I do not, though, build a /partner-type/consultants/seo/ page which would compete with my /pros/seo/consultants/ page. I have determined that I want to organize my site by skills/verticals/business types and not type of provider (agency/consultant). This was a keyword research decision. If you have many SKUs on your site, at some point you will not be able to have all of them on your top level category page. You can use subcategories, as talked about above, to further organize and filter down on your products, but you’re still going to need to use pagination on your categories and subcategories to get all of your products indexed. Noindex/follow all paginated pages so as to not deal with duplicate content. Some people will tell you that you should canonical your paginated pages back to your base page. I do not agree with this and have seen the rel next/prev coupled with noindex/follow work better for rankings on the sites I have worked on. At the end of the day, great onsite SEO goes way further than many people think. I am constantly surprised by the sites I am brought on to help that do not have the basics of onsite SEO down. That’s it. It’s not that hard. But so many sites fail to do it and simply style div classes with CSS to make the page look correct, even though they are not using a proper basic HTML hierarchy that the search engines need to make sense of your page’s information architecture. Because your category pages are some of the most important pages on your ecommerce site, optimizing them correctly to rank is the highest leverage thing you can often do. Aside from the basics of unique title tags, controlling indexing of parameters, pagination, and speeding them up, there are a few more strategies you can employ. 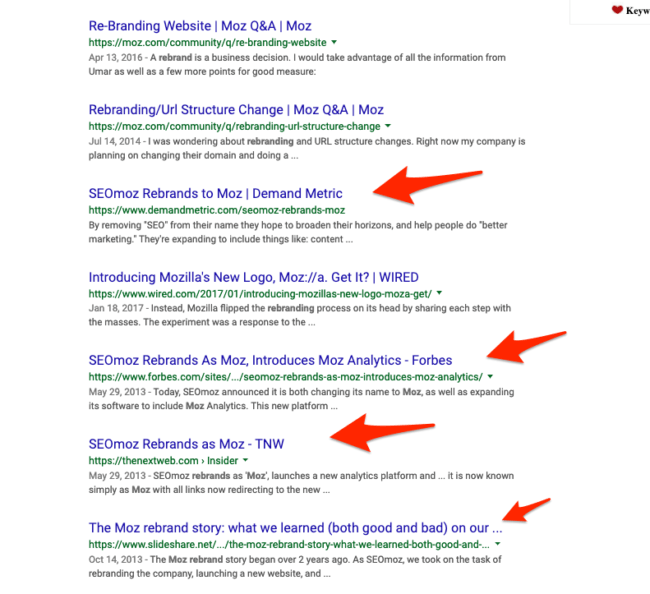 Even though they don’t have any links to this page (according to Moz), they still rank #1 for their main keyword and this guide is helping. Second, one tactic I like to employ on category pages to add semantically rich unique content is pulling in the beginnings of product descriptions onto category pages below their title. Finally, one large area of SEO that many ecommerce stores fail to take into account is page speed. Looking at your site’s speed overall isn’t the answer, though. In order to properly get an idea for your site’s speed (Time To First Byte TTFB is the real metric to look at), you need to look at each template to understand where your load times are slow and to then create actionable fixes. You can also create a matrix for highest potential to show traffic improvement by looking at the total potential traffic in a category and then benchmarking yourself against your competitors and how long your page takes to load versus your competitors. And don’t just think about traffic, but conversion as well. Even back in 2012, Amazon found that a 1s slowdown for their site would result in literally billions of fewer dollars in revenue. Once again, these are some of the most common culprits that you can fix. To get an idea of your page’s load time on desktop and mobile, you can use Google’s tool. Even when your ecommerce pages are perfectly optimized for SEO and load incredibly fast so that they convert well, the reality is that you still will not rank unless you also build links to those pages. It can sometimes feel impossible to build links to ecommerce sites, but I am here to tell you that it is absolutely possible. That said, it is always harder to build links to a category page (such as your Nike shoes page) than to a piece of content with novel data that is comprehensive for the topic and timely to the audience. So how do you build links to your ecommerce site? Here are a few strategies that we’ve seen be successful. Category pages are notoriously difficult to build links to because they are transactional in nature and on many sites are simply a list of products. These are not very link-worthy and attractive, and so you’ll have to do a bunch of work to get links to these. While that work may be worthwhile if you can substantially improve your rankings and traffic and conversions, it will still be more work than necessary. Instead, an easier way to do this is combine your content types and add an in-depth guide with useful statistics, data, and content that helps a person go deeper on how to use the product and helps them see that you are indeed an expert to be trusted. This can also help you with acquiring links as instead of referencing just a category page in guest posts or other places you can reference the statistic which just so happens to live on your category page. A second way to build great links to ecommerce sites is to invest in content marketing. When thinking of “content marketing for ecommerce”, we’re not thinking about 500 words “blogs for SEO content” stuff. Instead I am talking about industry-leading content that no one else has that will gain attention and shares, and then ultimately links as you put some promotion behind it. To do this, brainstorm the questions you have (or use a tool like Answer The Public) to learn what people are asking. Consider what your competitors are not doing (eg, video) and then try to do that as it will set your company apart. A pro-tip for using this content to help your category page rankings is to also link to your category pages from this content. And if you’re teaching people how to do what you’ve done, you can use a list of links back to your category pages as examples. It’s useful to those you are teaching and you get links back to your important pages! Thirdly, a great way to build links is to launch new products. This is a harder strategy if you’re creating your own products from scratch, though it can be more effective that way when you can create something novel that makes people in the industry shriek in approval which then gets industry press. The key here is to launch something new/novel and then make sure you are telling the story about WHY you did it and what it means. You’re solving a specific problem (hopefully), so tell that story and don’t be afraid to be a bit controversial. Don’t slam your competitor outright, but talk about how what you’ve launched is different because it makes people’s lives easier/better/more beautiful/healthier/whatever. There are so many facets to SEO these days that it can be hard to know where to start. Hopefully this section gives you a good start into identifying issues on your site and starting to refactor it into an SEO powerhouse, or to take it to the next level if you’ve already built a great base.